The enormous "Statue of Unity" has been condemned for its lack of environmental oversight and its displacement of local Adivasi people, whose land was forcibly taken to build it. The Gujarat government says it will promote tourism and sustainable development. The visit marks 25 years since India and Israel established diplomatic relations and comes after billions of dollars in defense deals. A huge billboard declaring "Welcome to Trump Village" in Hindi and English, accompanied with a beaming portrait of the US president, was unveiled in the tiny settlement officially known as Marora. Prior to the signing of the Paris climate agreement, few nations saw India as a leader in climate policy. But in 2015, the world’s third-biggest CO2 emitter began a breathtaking transformation, embracing renewable energy and slashing growth in carbon emissions. Now, the country of 1.3 billion people is a leader in clean energy in the developing world. A friendship marked by bear hugs, tea and strategic interests: President Obama welcomes Indian Prime Minister Narendra Modi to the White House. Two Indian political cartoonists have experienced pressure to censor their own work. Reporter Anu Anand is based in Delhi. She tells host Lisa Mullins that Narenda Modi has cultivated a pro-business image in the western Indian state of Gujaret, and has helped make it one of the richest states in India. In his campaign speeches, Narendra Modi eloquently conjures images of an India free from poverty and corruption, where no one goes hungry, where plumbing and electricity are universal and the poor have access to education. But the Hindu-nationalist is a deeply divisive politician. It's the largest exercise of democracy in the world, and candidates competing for India's prime minister position have a lot of ground to cover if they want votes. One candidate decided the best way to do that was to be in 100 places at once, quite literally. As a hologram. 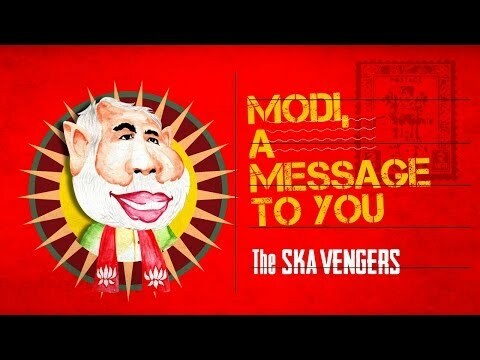 A New Delhi ska band, the Ska Vengers, has covered the '60s and '70s hit "Message to You, Rudy" and turned it into a political message that blasts the frontrunner in India's month-long elections, Narendra Modi. Deepak Singh grew up in Lucknow, India, thinking Indians were the good guys and Pakistanis the bad guys. Now that he's moved to the United States and finally met people from Pakistan, he sees things differently. Narendra Modi is widely expected to walk away with victory in India's ongoing election. But it's no sure thing, one India writer suggests. A landslide victory for India's BJP has left the Indian community in the US divided and wondering what the new government of Narendra Modi might bring. Priceline offers to let you name your own price for your hotel, but it's not quite literal. A group of Paris hotels are letting you stay at their hotel and pay as much as you want when you check out. Meanwhile, the death toll continues to mount in Gaza, and protests are mounting around the world. Plus autocorrect — it's much more complex than you might think. That and more in today's Global Scan. Hindi and Urdu are similar when spoken. But they use different scripts-- and have been cultural and religious symbols.